For those of us unlucky enough to live in the northern regions of the U.S. during the first week of 2018, escaping single-digit temperatures has been a priority as of late. While Tampa-based travel guide expert Andy Berke will tell you that it’s nearly impossible to plan a successful vacation with short notice, he’s here to offer timely insider advice for next winter. Whether you’re looking to travel to his region of Tampa, Florida or seek the allure of New Orleans and Nashville, there are few reasons not to head south and enjoy the hospitality while you’re at it. We encourage you to continue reading, learn a little bit more about Mr. Berke and use his travel tips to help plan your escape next winter. If you can’t stand the cold: Then head to the southwest. Andy Berke would suggest that those on the East Coast who are truly looking for a different climate make a cross-country jaunt to Arizona, Nevada or New Mexico. With average daytime temperatures hovering around 63 degrees in Arizona, 43 degrees in Nevada and 48 degrees in New Mexico during the winter months, it’s a far cry from single-digits and sub-zero wind chills. On top of that, you’ll finally be able to cross off Flagstaff, Las Vegas and Roswell off your list of must-see locations. If history is more you thing: The eastern seaboard of the U.S. is rich with history, given the fact that the first U.S. colony was founded in 1607 and we’ve been on the move ever since. 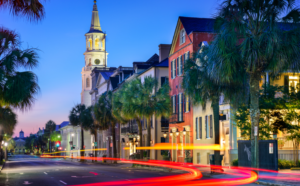 To get a taste of Americana and its role in architecture, local culture and lore, Andy Berke suggests Charleston, South Carolina; Savannah, Georgia and Richmond, Virginia. Among the top historical sites to see in these three cities include Civil War staple Fort Sumter, Bonaventure Cemetery and the Henricus Historical Park. If you want to unwind: If you’re going to travel south for warmer weather, why not let loose and truly enjoy your time spent outdoors. If this is the case, New Orleans and Nashville should top your must-visit list. According to Tampa-based travel expert Andy Berke, New Orleans must-do locations include a nighttime stroll down Bourbon Street, trip back in time at the National World War II Museum and street car ride to the Garden District for a stroll through one-of-a-kind homes. In Nashville, Mr. Berke suggests the staple Country Music Hall of Fame, Ryman Auditorium and the Grand Ole Opry House. No matter what sites you choose to visit, you’re still avoiding the bone-chilling colds of the northeast that come knocking every winter.